A Chord Too Far is the long awaited 4 CD deluxe box set comprising 48 tracks spanning seven solo albums and two orchestral albums, all personally selected by Tony Banks. Tracks have been remixed exclusively for this collection, although not in the modern sense, these are merely updated mixes. The albums represented are; A Curious Feeling, The Fugitive, The Wicked Lady, Soundtracks, Bankstatement, Still, Strictly Inc, Seven – A Suite For Orchestra, Six Pieces For Orchestra. Esoteric/Cherry Red have brought the music of Genesis members back to public before with their sterling work on the 30th Anniversary edition of Tony Banks’ A Curious Feeling, as well as the Squackett (2012) project with Steve Hackett, Anthony Phillips with the Harvest Of The Heart box set (2014) as well as the glorious Ultimate Edition of The Geese And The Ghost. Esoteric do quality in spades, albeit they are a small record company with a big heart for their releases shown through their diligence and care taken with each release. 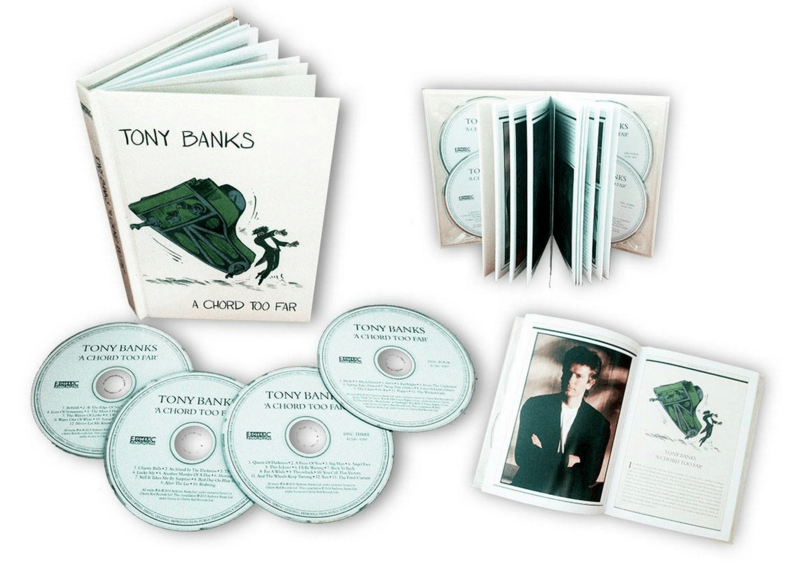 A Chord Too Far continues this pattern by bringing the work of Tony Banks together in a box set that acts as a sampler of what is to come with future releases of Tony’s albums up to Bankstatement – according to the information provided on the promo release of this box set. Although, I am sure I am not alone in championing the continuation through Still and up to Strictly Inc.
Whilst Tony Banks is a founding member of Genesis and known for his ivory tinklings, his skill also extends to synthesising and programming that is more apparent within his own solo work, where you see his function as producer come alive. Featuring a 60 page book with a brand new interview with Tony Banks where Tony discusses with Mark Powell each solo album represented in the collection. Aside from this personal look from Tony the booklet houses previously unpublished photographs and graphics from the albums and sessions. Accurate production notes and credits run alongside the track listing. Admittedly an insight from collaborators on certain albums could have been included and interviewed such as Nik Kershaw or Fish. Promotional Picture depicting the full release materials. Track selection across four discs is a bit of an audio jumble acting more as a buffet than a chronological 7 album course. Luckily however this presents fans of one particular album or era with another chance to hear what was on an album or soundtrack CD that they may have missed out on the first time. Guaranteed to be skeptical Genesis fans who liked one album finding gems amongst the other tracks. sounds albeit in stereo to the masses. Arriving late to Tony’s material means it is hard for I to have familiarity with it, especially as some of his previous catalogue has been deleted so obtaining it is a little trickier. Nevertheless, Esoteric/Cherry Red are doing something about that with a programme of releases expected from throughout Tony’s catalogue. Most surprisingly is material from The Fugitive (1983) especially By You. It sounds like someone has removed an inch thick level of crud from the recording and you can finally hear the true recording underneath it. These early stereo remasters/remixes whet the appetite for the surround sound releases. Beginning with an infection stabbing keyboard hook combined with Tony’s voice, By You is an ear worm echoing inspiration from Yellow Magic Orchestra. There is a slight charm from the original that is last on the drums, a reduced reverb presence might be the cause for this, but that’s a minor gripe with a track that is exceptionally enjoyable. Another song that has grown on me with repeated listens is called You Call This Victory. To make a typical but accurate comparison, it is reminiscent of a lost Genesis song, pre 1986. You Call this Victory originally appeared on Soundtracks (1986) an album displaying some of Tony’s work for films. It’s a pity the film accompanying You Call This Victory and other tracks from the era didn’t become box office smashes because the anthemic nature of the song is ideally placed. Tony’s ability to write and record music that seems light years ahead is evident in the material from The Fugitive, a creation of sounds that are several years ahead of what else was going on at the time. Tony also wrote songs with themes about 20 years ahead of them such as within Charity Balls from Strictly Inc (1995). Oh how those crows have come to roost of those whom attend Charity Balls and try to fit in to disguise their dark alter ego’s. The box set also goes on to showcase the eclectic mix of male and female singers all of whom bring their unique vocal stylings to a wide variety of subject materials, starting off with the following: Kim Beacon, Tony Banks himself, Toyah Wilcox, FISH, Jayney Klimek, Alistair Gordon, Nik Kershaw, Jack Hues. The range of singers bring a healthy dose of personality into each song whilst being able to work with Tony’s wide ranging subject matter. The orchestral work on the final disc really is something for those who were not aware of Seven (2004) and Six (2012). Displaying Tony’s affliction for great string pieces, especially those who did not listen to The Wicked Lady soundtrack. Tony seems very comfortable in this genre, although I assume that people can only hope he does return to his pop/rock writing with a follow up to his 1995 collaboration with Jack Hues (Strictly Inc). I have read comments from a variety of fans who have bemoaned the lack of additional extra material in the form of demos or alternate takes of Tony’s material. Now that the cat is out of the bag with the intention of Esoteric/Cherry Red issuing remasters and re-releases of Tony’s work then it would only serve to make sense to hold back additional material for these deluxe packages and where possible any visual material of either Tony in the studio writing/recording or the music videos/outtakes of these if they are available. Esoteric are selling this boxset through their webstore at this price, £29.99 it maybe more expensive at different retailers. Many thanks to Vicky for her assistance with the review materials at Esoteric.